EXPLOSIVE! That was Tinker’s Bridge canal in Sunday’s spring league round – with the top five netting well over 120lb of bream between them. 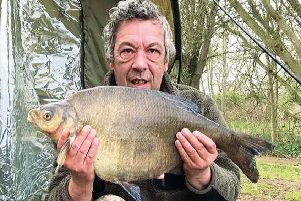 Taking the lion’s share Maver MK Black’s Steve Rose made the most of a far bank deep spot to catch throughout the match, on red maggot and worm, for a mind-blowing 44-12 of bream to 4lb. At the next peg Andy Curless (Black Horse Black) had 22-14 which, on most other days would have won hands down. A third man topped 20lb as Browning Black’s Damien Green netted 21-13. GoneFishin’s Paul Abbott was fourth, 16-15. GoneFishin were top team with 46 points. ‘Horse Black totalled 45 with Maver MK Black and Tackle Hub Silver tied on 39. With one round to go – and 14 points for a section win – just nine points cover the top five teams with ‘Fishin current leaders on 114, one point ahead of ‘Horse Black. Netherlands predator fan Tim Reinhard – over on an ‘internship’ with Aston Martin developed an email friendship with WIllards staff before arriving. On their advice his first trip was to Brad’ll canal...where he landed the 90 centimetre pike pictured! Match addict Kevin Osborne turned specci-hunter when he had a brace of Bradwell Lake bream BOTH estimated to be in double figures! Local hot rod Michael Buchwalder (pictured) is gearing up for another crack at Ireland’s Lakelands world pairs championships, in September, on the Shannon and Erne systems after finishing fourth with Rod Scott, last year. Prizes include Irish sponsorship of €15,000 plus £8,500 from Daiwa. If you fancy a great crack, visitwww.worldpairsangling.com or call 07711 607200 (English mobile call). MK Vets Clattercote do saw Bob ‘super star’ Gale struck lucky with a mostly carp 65-8. Ken Mott had 50-12 and Austin Maddock 49-8. Weights were low on Linford’s Boatyard canal...but for Josh Spearman the glory was a mile high! Fishing his first ever match the 14-year-old won with 3-3 – a pound-and-a-half clear of club ace Mick Hefferon’s 2-11. And just to heighten Josh’s joy his dad, Chris had to be content with 1-12 and, said by some to be ‘a bit competitive’...was apparently seen kicking his bait bowl along the path in frustration. Parks Trust and Environment Agency staff, together with volunteers, put in some good work on the Ouzel recently, jetting out spawning gravels, installing deflectors to help keep them clean, and reinforcing banks. Arrangements have been made for John Harvey’s funeral to be held at 12.15pm on Friday May 22 at Milton Keynes Crematorium.